The Gwangju International Film Festival, which opened on the 8th under the slogan, "Hope for Peace", closed on November 12th after a five-day run. The closing film was a documentary about Aung San Suu Kyi's life, Aung San Suu Kyi-Lady of no Fear. The closing ceremony was attended by the director and the main actor of the opening film, Leona Calderon, director Jowee MOREL and actor Pilar PILAPIL, Chinese director Xie FEI and director CHUNG Ji-young of Unbowed, Some thirty film professionals as well as politicians attended the closing ceremony. 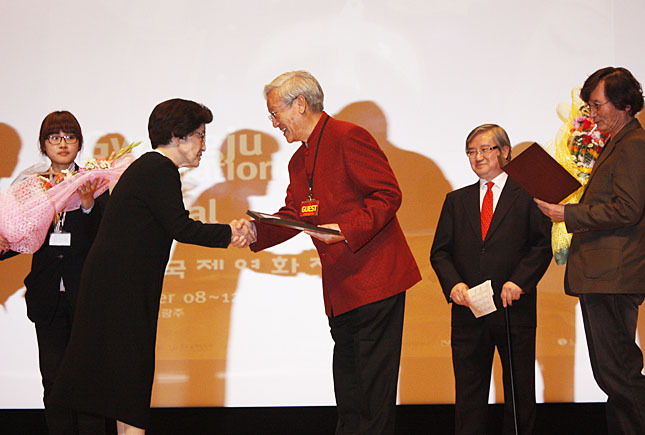 CHUNG Ji-young won the main prize of the second KIM Dae-jung Nobel Peace Film Award with the special award going to China's Xie FEI. The film which drew the highest level of interest this year was the first co-production between North Korea and China, Meet in Pyongyang. The Ministry of Unification asked all those attending the screening to write down their names on a separate piece of paper but despite this inconvenience, both of the screenings were sold out. The producer of the film, Li Shuai He said how moving and amazing it was for the film to be screened in South Korea during the question and answer session after the screening. The director of the closing film Aung San Suu Kyi-Lady of no Fear, Anne Gyrithe Bonne, said that after attending 30 other film festivals, Gwangju is the most cosmopolitan as there are more than 14 different nationalities in attendance, adding that the event is like a "global family".